On 4-5 October 2017, CW3E had the privilege of hosting visitors from NCAR and UCAR to discuss the development and implementation of West-WRF, the regional forecast model that CW3E is developing focusing on extreme precipitation. The team from UCAR and NCAR included Bill Kuo, the director of UCAR Community Programs, who also helped lead the development of WRF. Chris Davis, NCAR associate director and leader of the Mesoscale and Microscale Meteorology (MMM) Laboratory also attended, along with, David Gill, Jake Liu, and Wei Wang, WRF experts in computation, data assimilation, and modeling, respectively. The first day of the two day visit began with CW3E director, Marty Ralph, briefing the NCAR/UCAR visitors on CW3E, and how West-WRF supports the mission and goals of the center. After this introduction, CW3E researchers and staff had the opportunity to learn about best practices with respect to WRF computation, modeling, and data assimilation, as well as the new MPAS modeling system. The entire CW3E group had lunch with the NCAR/UCAR visitors and had a chance to hear all the CW3E updates including on AR reconnaissance, publications, and instrument deployments. After lunch, the CW3E West-WRF team shared the current applications and status of the West-WRF development with the UCAR/NCAR team. The afternoon ended with Bill Kuo giving the CASPO seminar on assessment of the impacts of assimilation of COSMIC radio occultation measurements in typhoon forecasts. The second day of the visit, allowed for detailed discussions on many of the technical aspects of West-WRF development and applications. The UCAR/NCAR team provided recommendations to the CW3E researches and staff on ways to improve the implantation of West-WRF as well as design experiments. 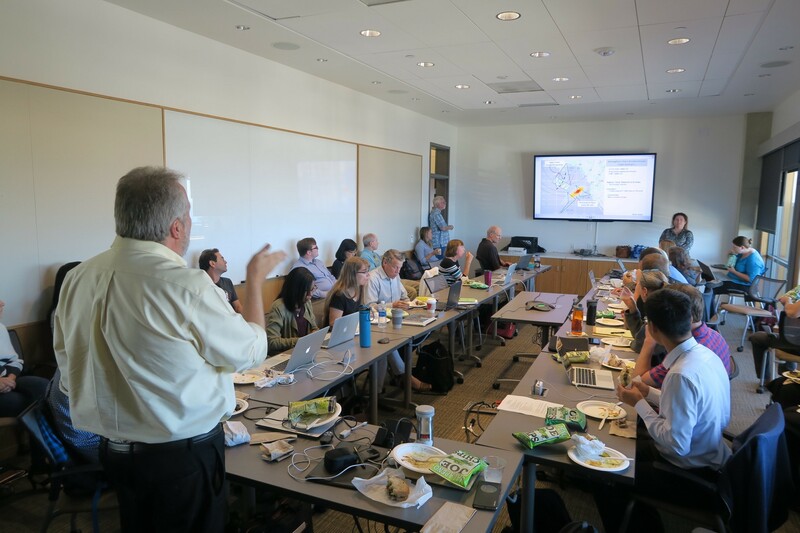 In addition the groups discussed ways for the CW3E team to provide feedback in the WRF development at NCAR/UCAR through sharing new code for verification metrics and scientific and technical advancements made through recent experiments. The meeting was a very productive initial collaboration between CW3E and UCAR/NCAR and we are looking forward to many more. The engagement of UCAR and NCAR in supporting one of its member institutions technical development efforts is greatly appreciated.